Since the 2013 floods, The City has dedicated itself to building resiliency to flooding here in our city. Building resiliency to flooding is a top Council priority. Since the 2013 floods, The City has repaired, restored and recovered from devastating and costly flood damage, and is working hard to build flood resilience by implementing 27 recommendations provided by the Expert Management Panel on River Flood Mitigation. City teams have conducted a number of conceptual and technical studies, as well as in-depth reviews to better understand our water ways, flood risk, changes to the rivers after the 2013 flood and land use policies. Now, we are advancing further by developing a comprehensive suite of mitigation measures for Calgary through a consultative, citizen-focused approach. The first stage of engagement in 2016 was a Community Advisory Group. 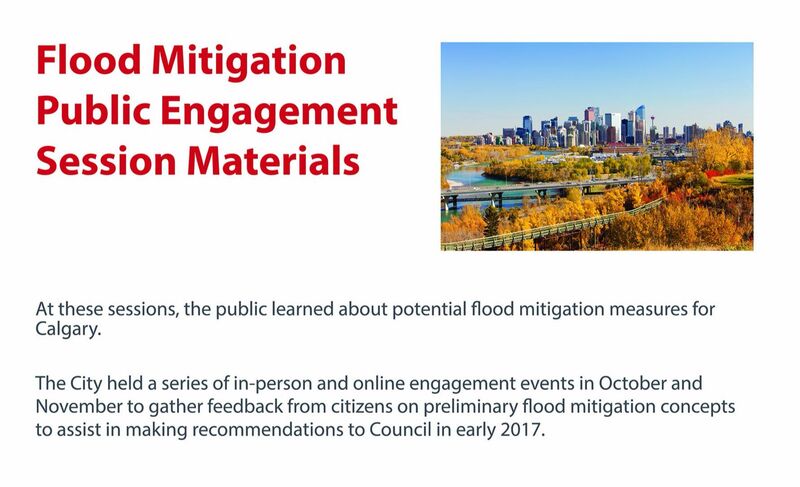 Our next step provides citizens across Calgary with public events where they can share their thoughtful and informed opinions on proposed flood mitigation projects. The information gathered there – along with planning principles, technical engineering studies, watershed management practices, subject matter expertise and City policy, as well as potential environmental, social and economic impacts – will inform recommendations being brought to Council in early 2017. As of March 23, 2017 City Administration brought their report to the Standing Policy Committee on Utilities and Corporate Services. That report is available online here. Please see www.calgary.ca/floodinfo for the Flood Resilience and Mitigation Program overview. Learn more about our upcoming workshops, information sessions, and online engagement activities at an upcoming Pop Up Event - see the 'Key Dates' section for details. Thank you to all who provided input. Here is the report of all that we heard. The What We Heard Report is the summary and themes of all the feedback that was provided. The verbatim document includes all the ideas and comments we received from everyone who participated in person and online. If you are interested to learn more about the project there is project information that was shared with all who participated in this engagement process. Our opportunities for participation were from September - November 2016: Citizen Workshops, Public Open Houses and Online Engagement. City Administration makes flood mitigation measures recommendation to Council.